Christine made wine and admits before the picking season even began she felt like giving up. Patton Valley leadership was involved with both the internship and the entire vineyard, which was helpful and intense, but Christine says most of her co-workers now feel like family. As a certified B-Corporation they were well-versed in sustainability practices and excited to bring a young and motivated member onto their team. Christine credits Derek Einberger with her focus on perfection and says he created an atmosphere of both hard work and learning. It took quite a while before Christine could decide in which direction she should take the sustainability part of her internship. After spending some time familiarizing herself with the already implemented sustainability practices of the vineyard and with existing programs in the Pacific Northwest, there was no doubt in her mind: she needed to get some butterflies onto this vineyard. Using about 30 milkweed plants, Christine hand-planted on vineyard property enough plants to be able to say she assisted in the vital part of grape farming: pollination. The vineyard had their own honeybees and had taken steps in this direction, but with the aide of a local nursery, Christine was able to take it to the next level. Monarch butterflies, in particular, play a vital role in pollination and are a key species for supporting global agriculture. They rely on milkweed species for subsistence as well as reproduction purposes. Butterflies have had a 90 percent decline in their recorded North American populations. Such a rapid decline has been due to the conversion of primary habitat into developed lands. Milkweed species are native to the Pacific Northwest and are relatively easy to cultivate. Planting milkweed gives a permanent home to these wanderers and aids the vineyard in the process. It’s a win-win. Although hindsight often sweetens the experience, there is little doubt in Christine’s mind that she worked the hardest she had ever worked in those grueling weeks of harvesting grapes. There are thousands of fully operational full-time vineyards, and huge operations like vineyards and wineries always need sustainability help. Vineyards are made up of a lot of moving parts, and no single vineyard is perfectly sustainable, but they’re working on it. The community of vineyards in the area near Patton Valley were particularly known in the region for their work to be both as environmentally minimally impactful as possible and for their water conservation efforts. Waste in winemaking is inevitable, but Christine notes that they tried their hardest to not produce any more than necessary. If following in her lead and pursuing either work or training in vineyard sustainability, Christine said to be prepared to give up your entire normal life for harvest. 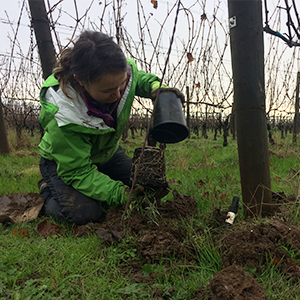 She says to prepare to feel stupid or underprepared, especially in vineyards where sustainability is a relatively new concern, but that it is also an incredible learning opportunity and a lot of fun. Although the internship and its outcomes were just as she anticipated, Christine admits she learned lessons that she had not planned on learning. You can learn more about Christine’s internship on her personal website.